Reduces noise by 80%! - Assembles in 5 minutes with absolutely NO NUTS / BOLTS or any TOOLS. Galvanised & Powder Coated - Rust Proof. Protects your Pool Pump / Filter with engineered ventilation gaps. Easy lift out access from front & top. TheModel 1604.1100.B/LESS model Pool Filter / Pump Cover can be assembled in 25-35 minutes (on average) by one person with no handiwork experience or any tools. The Pool Filter & Pump Cover weights approx. 100 KGS (in total) and made of 1 mm thick Galvanised steel and finished with dense Powder coating. All external and internal accessories are either galvanized or made of solid stainless steel. The Galvanization means that the box will not rust for 15+ years. The unique design and fabrication ensures withstanding the harsh Australian environment and extreme weather conditions. The box has 20mm thick dressed pine timber piece on the rear panel - for affixing controller units, Chlorinators and Power Points. There're also 25mm ventilation gaps at the front and back of the box allowing for proper air-flow in and out of the box to protect the equipment. The rear ventilation gap also allows for conduits / wirings to pass through in and out of the box (for example: power chords.). The lid can also be totally removed (2 easy hinge pins on either side) allowing for larger conduits / equipment to pass through. The front of the box allows for unhindered access into the box - making servicing the equipment a breeze. The front door can be fully removed with no bars across the middle of the box- which means that you can physically step inside the box when servicing the equipment. The 20 mm thick Acoustic Foam is industrially affixed internally on every panel – and comes certified by an Acoustic Engineer to reduce noise by up to 80%. The Pool Filter & Pump cover is deisgned with child safety features making it virtually impossible or children to access the box. The box can aso be locked using any common lock. Assembled in 5 - 20 minutes - NO NUTS, BOLTS or any TOOLS needed. Save money on design - A custom designed box made from timber or other material will usually cost more - and won't look as good! Save money on equipment - Inferior or cheaper alternatives may cost you more money in the long run as they may be poorly ventilated and damage your equipment. Comply with all state and council requirements with regards to soundproofing and any other structural aspects. The Swimming Pool Filter & Pump Enclosure / Pool Equipment Cover / Shed - reduces noise by 80%! with our optional acoustic foaming - assembles in 5 minutes with absolutely NO NUTS / BOLTS or any TOOLS. The Pool Pump Cover is made of Galvanised steel with powder coat finishing - providing protection against rust. The Pool pump shed is designed to protect your Pool Pump / Filter and other equipment. 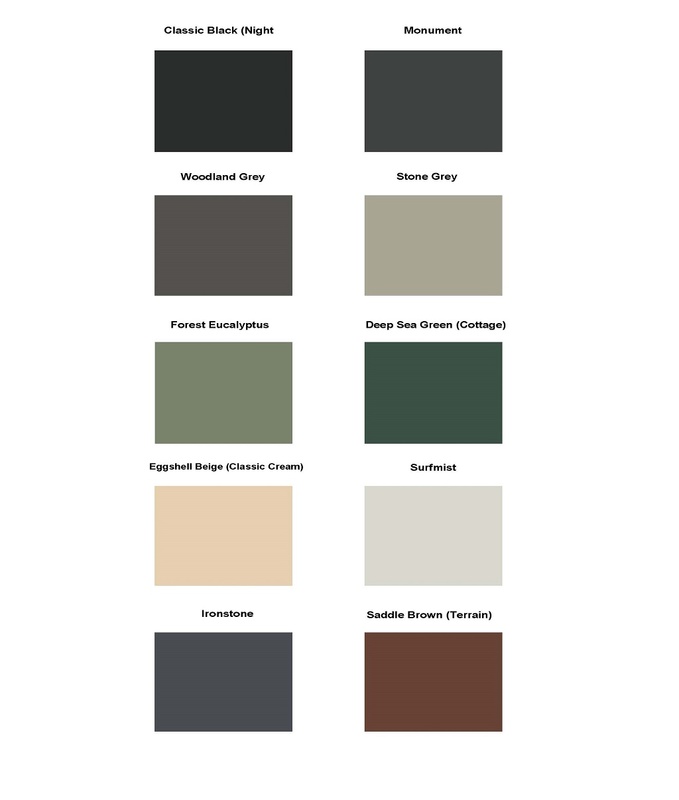 The Acoustic Box comes in 10 Standard colours as below. All the colours correspond to a colorbond colour. 1. The external measurements are virtually the same as the internal measurements throughout the box with the exception of the bottom and top of the box - where the metal bends to allow for the acoustic foaming to be housed. 4. The lid requires 45mm of clearance to fully open. So pls allow this (or more) if placing the box against a wall or other hard surfaces. The unique design of our Pool Filter / Pump enclosures means that there are absolutely NO NUTS & BOLTS and NO need for any TOOLS to assemble the box. On average, theModel 1604.1100.B/LESS model Pool filter cover (which is made up of 2 small boxes - joined in the middle by a Steel galvanised Channel) will take 25-35 minutes by one person to assemble. The box comes flat packed . The panels are joined together at the bottom by 4 corner brackets and locked at the top by 4 corner caps. The Acoustic Box delivers to all areas within the Sydney metro as well as regional NSW. Please click here for delivery or sales in other states . We charge the same delivery fee for all areas within the Sydney metro. We guarantee delivery within 1-2 business days (from order date) in over 90% of cases. Customers are also welcome to pick up (by appointment only) from our warehouse in Seven Hills (2147). Please see our delivery terms and conditions (in the T&C) section for more information. Deliveries within the Sydney Metro area: Within 2-4 workng days of order date. Interstate deliveries: Within 7 - 10 working days of order date. The above delivery terms are for standard sizes and colours only. Please contact us for custom sizes and/or colour orders for exact prices and delivery lead times. The Acoustic Box Pty Ltd will deliver to the delivery address and on the delivery date as indicated on the order form. We are unable to guarantee an exact delivery time. Delivery will take place between 7 am – 6 pm. Our driver/courier will deliver to the person specified on the order form. In the event the person is not at the property / no person is specified, the driver will leave the product(s) as close as practically possible to the front door of the property. The Acoustic Box Pty Ltd does not take any responsibility for any lost or damaged product(s) after delivery. The goods and/or services rendered remain the property of The Acoustic Box Pty Ltd until full payment for the said goods/services are received. Any claims for damaged or faulty products must be reported to The Acoustic Box Pty Ltd within 24 hours of delivery, otherwise it will be deemed the product(s) are received in good order and the full amount as per the invoice is payable . In the event the product(s) is damaged or faulty due to an error by The Acoustic Box Pty Ltd, we will deliver a new product(s) or panel(s) as per the order form. Delivery date for a replacement will be made within 14 business days. In the event The Acoustic Box Pty Ltd agrees to exchange a product (after delivery), an administration fee of $110+ GST will be charged. Additionally, the relevant delivery and pickup fee will also be charged in the event the new product is to be delivered to site. The Acoustic Box Pty Ltd will only allow exchanges (after delivery) if the goods have not been installed and remain intact in their original wrapping. The Acoustic Box does not offer any guarantees with regards the life of the powder coating as this will depend on the location and level of exposure to the elements. The Acoustic Box Pty Ltd’s credit terms are strictly 14 days from the date of the invoice. Credit does not extend to amounts exceeding the approved credit limit or to amounts exceeding the 14 days’ credit terms. Any claims arising from invoices must be made within seven working days of receipt of invoice. Copyright © 2019 - Acoustic Box Pty Ltd.